TomatoTown at LatteLand – Tomato Town organically grows heirloom tomatoes in the greater Kansas City area as well as Johnson County, Leawood, Lenexa, Olathe, Shawnee, Merriam KS, Independence MO and Kansas City Missouri, KCMO. Varieties include: Cherokee Purple, Brandywine, Stupice, Carbon, Black Krim, Black Cherry, Yellow Pear, Absinthe and Aunt Ruby’s German Green. If you are a fan of the photos Julie Denesha creates for TomatoTown, and you are already missing the summertime tomato season, take a moment to stop by LatteLand before October 6. 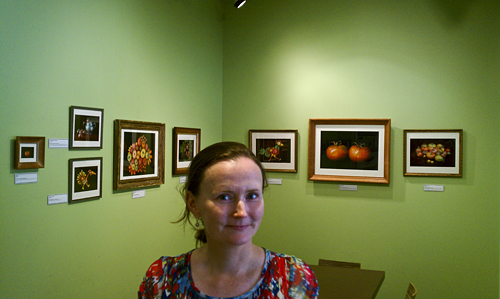 Angie Jennings, LatteLand’s curator of photography, has hung a show of heirloom beauties from TomatoTowns private collection in vintage frames. Mon – Thu: 6:00 a.m. – 9:00 p.m.
Fri: 6:00 a.m. – 10:00 p.m. Sat: 7:00 a.m. – 10:00 p.m.
Sun: 7:00 a.m. – 9:00 p.m. This entry was posted on Thursday, September 20th, 2012 at 2:18 pm. It is filed under Event, Latest Posts. You can follow any responses to this entry through the RSS 2.0 feed.